Kills And Repels Mosquitoes, Biting Flies, Gnats, Moths, And Other Listed Flying Insects. 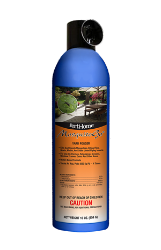 For Use On Porches, Patio Areas, Screens, Window Frames, Doors And Other Areas. Water-Based Formula. Treats An Avg. Patio (500 Sq Ft) – 4 Times. Application: Spray in short bursts. Hold can 24 to 36 in from plant. Lightly mist with a slow sweeping motion. Avoid excessively wetting the plant foliage. Consult label for specific application rates to control targeted pests.